Wilhelm Gause (March 27, 1853 - June 13, 1916) was a German-Austrian painter. He studied at the Düsseldorf Academy, and in 1888 exhibited his work in Vienna. 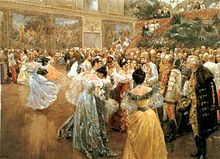 Perhaps Gause’s most famous work is “Court Ball at the Hofburg.” Created in 1900, it hangs today within the walls of the Wien Museum Karlsplatz, Vienna, Austria. It depicts aristocrats crowding around Franz Joseph I of Austria at the Hofburg Imperial Palace. On January 28, 2011, Another painting of his, Party on the Ice, 1909 was sold at Sotheby's in New York for $13,750. ^ "Wilhelm Gause". Art Appraisal. Mutual Art. Retrieved 21 May 2014. Several works by the artist have been sold at auction, including 'Party on the Ice' sold at Sotheby's New York 'Old Master & 19th Century European Art' in 2011 for $13,750. ^ "Wilhelm Gause". Painting/Artist. Artbol. Retrieved 21 May 2014. Unfortunately, very little is known about this outstanding German artist, whose paintings and drawings consist mainly of genre scenes. Gause studied at the Dusseldorf Academy and exhibited at Vienna in 1888. ^ "Court Ball at the Hofburg". Zazzle. Retrieved 21 May 2014. ^ "Creator:Wilhelm Gause - Wikimedia Commons". Commons.wikimedia.org. Retrieved 2014-06-04. ^ "Wilhelm Gause". Art Appraisal. Mutual Art. Retrieved 21 May 2014. This article about a German artist is a stub. You can help Wikipedia by expanding it. This page was last edited on 21 October 2016, at 13:31 (UTC).